where Ichannel is the channel current, VHall is the Hall voltage, e is the elementary charge and h is Planck's constant. The prefactor ν is known as the filling factor, and can take on either integer (ν = 1, 2, 3,…) or fractional (ν = 1/3, 2/5, 3/7, 2/3, 3/5, 1/5, 2/9, 3/13, 5/2, 12/5,…) values. The quantum Hall effect is referred to as the integer or fractional quantum Hall effect depending on whether ν is an integer or fraction, respectively. The striking feature of the integer quantum Hall effect is the persistence of the quantization (i.e. the Hall plateau) as the electron density is varied. Since the electron density remains constant when the Fermi level is in a clean spectral gap, this situation corresponds to one where the Fermi level is an energy with a finite density of states, though these states are localized (see Anderson localization). The fractional quantum Hall effect is more complicated, as its existence relies fundamentally on electron–electron interactions. The fractional quantum Hall effect is also understood as an integer quantum Hall effect, although not of electrons but of charge-flux composites known as composite fermions. In 1988, it was proposed that there was quantum Hall effect without Landau levels. This quantum Hall effect is referred to as the quantum anomalous Hall (QAH) effect. There is also a new concept of the quantum spin Hall effect which is an analogue of the quantum Hall effect, where spin currents flow instead of charge currents. The quantization of the Hall conductance has the important property of being exceedingly precise. Actual measurements of the Hall conductance have been found to be integer or fractional multiples of e2/h to nearly one part in a billion. This phenomenon, referred to as exact quantization, has been shown to be a subtle manifestation of the principle of gauge invariance. It has allowed for the definition of a new practical standard for electrical resistance, based on the resistance quantum given by the von Klitzing constant RK = h/e2 = 7004258128075570000♠25812.807557(18) Ω. This is named after Klaus von Klitzing, the discoverer of exact quantization. Since 1990, a fixed conventional value RK-90 has been used in resistance calibrations worldwide. On 16 November 2018, the conventional value was abrogated in consequence of the decision to fix the values of h (the Planck constant) and e (the elementary charge) at the 26th meeting of the General Conference on Weights and Measures. The quantum Hall effect also provides an extremely precise independent determination of the fine structure constant, a quantity of fundamental importance in quantum electrodynamics. The integer quantization of the Hall conductance was originally predicted by Ando, Matsumoto, and Uemura in 1975, on the basis of an approximate calculation which they themselves did not believe to be true. Several researchers subsequently observed the effect in experiments carried out on the inversion layer of MOSFETs. It was only in 1980 that Klaus von Klitzing, working at the high magnetic field laboratory in Grenoble with silicon-based samples developed by Michael Pepper and Gerhard Dorda, made the unexpected discovery that the Hall conductivity was exactly quantized. For this finding, von Klitzing was awarded the 1985 Nobel Prize in Physics. The link between exact quantization and gauge invariance was subsequently found by Robert Laughlin, who connected the quantized conductivity to the quantized charge transport in Thouless charge pump. Most integer quantum Hall experiments are now performed on gallium arsenide heterostructures, although many other semiconductor materials can be used. In 2007, the integer quantum Hall effect was reported in graphene at temperatures as high as room temperature, and in the magnesium zinc oxide ZnO–MgxZn1−xO. where gs represents a factor of 2 for spin degeneracy, and ϕ0 ≈ 6985200000000000000♠2×10−15 Wb is the magnetic flux quantum. 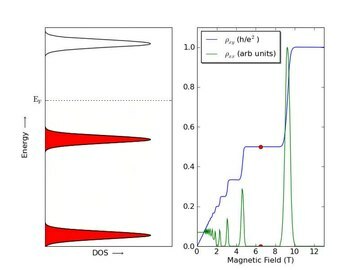 For sufficiently strong magnetic fields, each Landau level may have so many states that all of the free electrons in the system sit in only a few Landau levels; it is in this regime where one observes the quantum Hall effect. The integers that appear in the Hall effect are examples of topological quantum numbers. They are known in mathematics as the first Chern numbers and are closely related to Berry's phase. A striking model of much interest in this context is the Azbel–Harper–Hofstadter model whose quantum phase diagram is the Hofstadter butterfly shown in the figure. The vertical axis is the strength of the magnetic field and the horizontal axis is the chemical potential, which fixes the electron density. The colors represent the integer Hall conductances. Warm colors represent positive integers and cold colors negative integers. Note, however, that the density of states in these regions of quantized Hall conductance is zero; hence, they cannot produce the plateaus observed in the experiments. The phase diagram is fractal and has structure on all scales. In the figure there is an obvious self-similarity. In the presence of disorder, which is the source of the plateaus seen in the experiments, this diagram is very different and the fractal structure is mostly washed away. Concerning physical mechanisms, impurities and/or particular states (e.g., edge currents) are important for both the 'integer' and 'fractional' effects. In addition, Coulomb interaction is also essential in the fractional quantum Hall effect. The observed strong similarity between integer and fractional quantum Hall effects is explained by the tendency of electrons to form bound states with an even number of magnetic flux quanta, called composite fermions. which for the Bohr atom is linear but not inverse in the integer n.
Relativistic examples of the integer quantum Hall effect and quantum spin Hall effect arise in the context of lattice gauge theory. ^ F. D. M. Haldane (1988). "Model for a Quantum Hall Effect without Landau Levels: Condensed-Matter Realization of the 'Parity Anomaly'". Physical Review Letters. 61 (18): 2015–2018. Bibcode:1988PhRvL..61.2015H. doi:10.1103/PhysRevLett.61.2015. PMID 10038961. ^ Ezawa, Zyun F. (2013). Quantum Hall Effects: Recent Theoretical and Experimental Developments (3rd ed.). World Scientific. ISBN 978-981-4360-75-3. ^ a b R. B. Laughlin (1981). "Quantized Hall conductivity in two dimensions". Phys. Rev. B. 23 (10): 5632–5633. Bibcode:1981PhRvB..23.5632L. doi:10.1103/PhysRevB.23.5632. ^ A. Tzalenchuk; S. Lara-Avila; A. Kalaboukhov; S. Paolillo; M. Syväjärvi; R. Yakimova; O. Kazakova; T. J. B. M. Janssen; V. Fal'ko; S. Kubatkin (2010). "Towards a quantum resistance standard based on epitaxial graphene". Nature Nanotechnology. 5 (3): 186–189. arXiv:0909.1220. Bibcode:2010NatNa...5..186T. doi:10.1038/nnano.2009.474. PMID 20081845. ^ "conventional value of von Klitzing constant". NIST. ^ "26th CGPM Resolutions" (PDF). BIPM. ^ T. Ando; Y. Matsumoto; Y. Uemura (1975). "Theory of Hall effect in a two-dimensional electron system". J. Phys. Soc. Jpn. 39 (2): 279–288. Bibcode:1975JPSJ...39..279A. doi:10.1143/JPSJ.39.279. ^ J. Wakabayashi; S. Kawaji (1978). "Hall effect in silicon MOS inversion layers under strong magnetic fields". J. Phys. Soc. Jpn. 44 (6): 1839. Bibcode:1978JPSJ...44.1839W. doi:10.1143/JPSJ.44.1839. ^ K. v. Klitzing; G. Dorda; M. Pepper (1980). "New method for high-accuracy determination of the fine-structure constant based on quantized Hall resistance". Phys. Rev. Lett. 45 (6): 494–497. Bibcode:1980PhRvL..45..494K. doi:10.1103/PhysRevLett.45.494. ^ D. J. Thouless (1983). "Quantization of particle transport". Phys. Rev. B. 27 (10): 6083–6087. Bibcode:1983PhRvB..27.6083T. doi:10.1103/PhysRevB.27.6083. ^ K. S. Novoselov; Z. Jiang; Y. Zhang; S. V. Morozov; H. L. Stormer; U. Zeitler; J. C. Maan; G. S. Boebinger; P. Kim; A. K. Geim (2007). "Room-temperature quantum Hall effect in graphene". Science. 315 (5817): 1379. arXiv:cond-mat/0702408. Bibcode:2007Sci...315.1379N. doi:10.1126/science.1137201. PMID 17303717. ^ Tsukazaki, A.; Ohtomo, A.; Kita, T.; Ohno, Y.; Ohno, H.; Kawasaki, M. (2007). "Quantum Hall effect in polar oxide heterostructures". Science. 315 (5817): 1388–91. Bibcode:2007Sci...315.1388T. doi:10.1126/science.1137430. PMID 17255474. ^ D. B. Kaplan (1992). "A Method for simulating chiral fermions on the lattice". Physics Letters. B288: 342–347. arXiv:hep-lat/9206013. doi:10.1016/0370-2693(92)91112-M.
^ M. F. L. Golterman; K. Jansen; D. B. Kaplan (1993). "Chern-Simons currents and chiral fermions on the lattice". Physics Letters. B301: 219–223. arXiv:hep-lat/9209003. doi:10.1016/0370-2693(93)90692-B. D. R. Yennie (1987). "Integral quantum Hall effect for nonspecialists". Rev. Mod. Phys. 59 (3): 781–824. Bibcode:1987RvMP...59..781Y. doi:10.1103/RevModPhys.59.781. D. Hsieh; D. Qian; L. Wray; Y. Xia; Y. S. Hor; R. J. Cava; M. Z. Hasan (2008). "A topological Dirac insulator in a quantum spin Hall phase". Nature. 452 (7190): 970–974. arXiv:0902.1356. Bibcode:2008Natur.452..970H. doi:10.1038/nature06843. PMID 18432240. 25 years of Quantum Hall Effect, K. von Klitzing, Poincaré Seminar (Paris-2004). Postscript. Pdf. Avron, Joseph E.; Osadchy, Daniel; Seiler, Ruedi (2003). "A Topological Look at the Quantum Hall Effect". Physics Today. 56 (8): 38. Bibcode:2003PhT....56h..38A. doi:10.1063/1.1611351. A. Baumgartner; T. Ihn; K. Ensslin; K. Maranowski; A. Gossard (2007). "Quantum Hall effect transition in scanning gate experiments". Phys. Rev. B. 76 (8): 085316. Bibcode:2007PhRvB..76h5316B. doi:10.1103/PhysRevB.76.085316. E. I. Rashba and V. B. Timofeev, Quantum Hall Effect, Sov. Phys. - Semiconductors v. 20, pp. 617–647 (1986).